In Gout Laser Therapy, I explain low-level laser treatment for gout. Specifically, I describe the history of this gout treatment. Then I explain how you might make it work for you. I wrote Gout Laser Therapy for GoutPal Seekers. So if you do not know which type of gout sufferer you are, read Questions for Gout Sufferers first. Here is a list of research into gout laser therapy. To explain, Gout Laser Therapy is my name for Low-Level Laser Treatment (LLLT) applied to gout sufferers. Also, it’s called cold laser therapy, low-energy laser therapy, or similar names. So, I offer a timeline of research into this alternative to conventional gout pain relief. 1996: Can Low-Energy Laser help Gout? Antipa announces “opinions about the Low-Energy Laser effects in rheumatic diseases”. But, I struggle to find details. Because the full report is hard to access. So, let’s wait for 2015. Soriano studied several groups of people with gout or other crystal deposit diseases including pseudo gout. Each disease group was split into two treatment groups. Treatment was either diclofenac, a Non-Steroidal Anti-Inflammatory Drug (NSAID) or low level laser therapy. Both laser therapy and diclofenac achieved rapid pain relief in patients with acute gouty arthritis without significant differences in efficacy. Laser therapy was more effective than diclofenac in patients with chronic pyrophosphate arthropathy and in patients with chronic apatite deposition disease. Castano noted that, for inflammatory arthritis, “longer illumination times were more effective than short times regardless of total fluence or irradiance”. Helium-neon laser reduced the intensity of the inflammatory process in the arthritis model induced by hydroxyapatite and calcium pyrophosphate crystals. In this case, the inflammatory process is similar to gout. But note that this is induced inflammation in mice. So, we need similar studies on gout suffering humans. Also in this year, the World Association for Laser Therapy published dosing recommendations. But the latest (2010) recommendations do not include gout. Although, they cover several other types of arthritis. Furthermore, there are still no updates by June 2017. 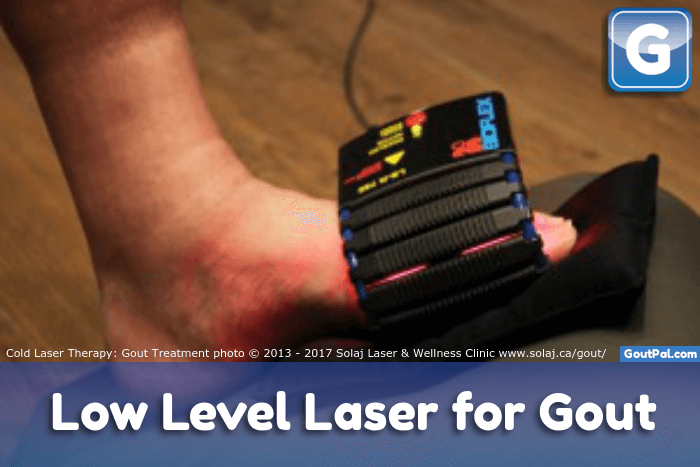 2012: Is Low Level Laser Therapy Good for Gout? Explores many aspects of LLLT for inflammation. Includes our 2006 reference to crystal arthritis laser therapy. So, it could have more relevant information in the other 130 references. But, probably only relevant to the keenest gout researchers. Has lots of general information about LLLT. Mantineo reveals the secrets of gout laser therapy. Because his doctoral thesis explains that Antipa grouped gout with other “inflammatory rheumatisms”. However, we learn that the type of laser used can be important. So, this confirms the 2006 finding that laser therapy is better than NSAIDs. Also, it reminds us that 1 in 3 people recover without treatment. A Cochrane review of low-level laser therapy found mixed evidence for benefit in the treatment of osteoarthritis pain; further research is needed to determine techniques, dosage, and anti-inflammatory effects of low-level laser therapy in the treatment of osteoarthritis; a Cochrane review of low-level laser therapy found some evidence of positive efficacy in the treatment of pain and morning stiffness associated with rheumatoid arthritis; however, more research on the appropriate wavelength, treatment duration, dosage, and site of application over nerves (instead of joints) is needed. In this case, the greatest benefit from the report is not about gout laser therapy. Because it is a small part of a large array of ways to treat gout. So, it’s ideal for every GoutPal Seeker. Surely, I’ll make reference to this report in several other pages. In summary, these reports confirm low level laser therapy is a good candidate for gout relief. But, we need more gout-specific studies to help optimize the machines, machine settings, and laser therapy dosing for gout. Finally, you know the history of gout laser therapy. But to see if it applies to you, you must search for a local practitioner. Then you must assess if gout laser therapy is right for you. I can help you in my gout forum. You can get casual help with your gout problems as they arise. Or, I can guide you with a structured plan to find the best way to treat your gout. Either way, please share your questions, experiences, and opinions in the gout forum now. Leave Gout Laser Therapy to browse Gout Relief Guidelines. Antipa, Ciprian, et al. “Our clinical experience in low-energy laser medical treatments.” Optical Engineering 35.5 (1996): 1367-1371. Soriano, F., et al. “Photobiomodulation of pain and inflammation in microcrystalline arthropathies: experimental and clinical results.” Photomedicine and Laser Therapy 24.2 (2006): 140-150. Castano, Ana P., et al. “Low-level laser therapy for zymosan-induced arthritis in rats: Importance of illumination time.” Lasers in surgery and medicine 39.6 (2007): 543-550. Rubio, Claudia Reinoso, et al. “Helium-neon laser reduces the inflammatory process of arthritis.” Photomedicine and laser surgery 28.1 (2010): 125-129. Chung, Hoon, et al. “The nuts and bolts of low-level laser (light) therapy.” Annals of biomedical engineering 40.2 (2012): 516-533. GoutPal Members might download the PDF file. Mantineo, Matías Eduardo Antonio. Laser therapy in inflamation: mechanisms, techniques and instrumentation. Diss. 2015. GoutPal Members might download the PDF file. Wallwork, Rachel S., Fallon E. Chipidza, and Theodore A. Stern. “Obstacles to the Prescription and Use of Opioids.” The primary care companion for CNS disorders 18.1 (2016).